One of the biggest joys of March Madness every year is seeing the excited faces of a team that finds out it made the tournament or upset a giant. This year was no different, as the Belmont Bruins were absolutely ebullient after seeing they went from a team on a bubble to a team that will go dancing. Belmont was given a No. 11 seed and will battle the Temple Owls in the First Four to see who will face the No. 5 seed in the East Region, the Maryland Terrapins. Sure, they may have hoped to avoid a play-in game, but making the NCAA tournament for the first time in four years is reason enough to celebrate. Belmont was one of the top bubble teams after running up a 26-5 record that included a 16-2 record in the Ohio Valley Conference. 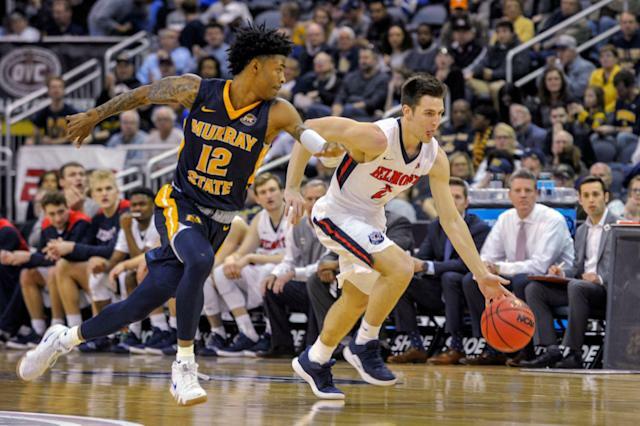 But after sharing a regular season championship with the Murray State Racers, they fell to Ja Morant and the Racers in the OVC Tournament championship game. The Bruins had never made the NCAA tournament before with an at-large bid, so the loss could have been a death kiss. But they beat the odds and joined the Owls, Arizona State Sun Devils and St. Johns Red Storm as the last teams to make the cut. Belmont will likely be a favorite heading into Tuesday’s game too. The Bruins are ranked 54th by kenpom.com, while Temple comes in at 76. Meanwhile, they are also ahead in the NCAA’s new NET rating, 47 to 56, although the NCAA may not care about their new rating as much as they let on. Plenty of other schools had exciting days when they heard the good news. Some were more excited than others though, obviously, because they already knew they had automatic bids or were safely in. Still, it’s hard not to smile when you the unbridled joy of these college teams.